Your play equipment should be inspected on a regular basis. 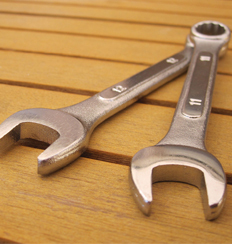 Check all nuts and bolts twice monthly during the usage season for tightness. Tighten as required. It is particularly important to check & tighten bolts at the beginning of each season. Check swings, chains, and slides for cracks or deterioration. Replacement should be made at first sign of deterioration. It is also important to stain and seal the wood components of your play system as needed. This will not only keep your play set looking nice, but it will also prolong the life of the system by limiting moisture and UV rays that the wood is naturally exposed to. It is recommended that you use a high quality stain/sealant. We recommend our own water based acrylic sealant that is specifically designed for the cedar lumber used on our swing sets (purchase clear sealant here, or a tinted sealant here), but any reputable paint store will be able to recommend a suitable product for your play system. If any of the following conditions are noted, they should be removed, corrected or repaired immediately to prevent injuries. Missing or damaged equipment and or components, such as hardware, handholds, panel slats, etc.